The affordability crisis can be seen in all parts of the country. 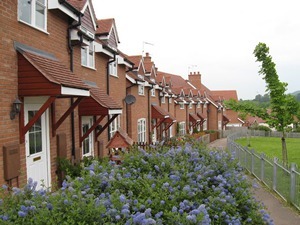 New figures published by the government today show that over 27,000 households have bought a home through one of the Help to Buy schemes, including more than 24,000 under the equity loan scheme and 2,500 sales through the mortgage guarantee scheme. Yet the government insists that the scheme is the best way of stimulating house building, even though the rate of new housing starts remain sluggish, rather than Keynesian direct bricks and mortar investment in social and affordable housing. The government also insists that a housing boom is a long way off. Not so Bank of England governor Mark Carney, who has signalled that Britain’s booming housing market presents ‘deep structural problems’ to economic recovery as average house prices soar in most parts of the UK and the number of approvals for larger mortgages begin to rise. While the number of homes bought under the Help to Buy scheme is a relatively small part of overall house sales volumes, the scheme has clearly bolstered housing market activity alongside social housing sales of more than 11,000 in the last year. 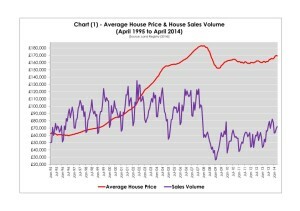 Demand has been stimulated in the short-term while housing supply is inelastic so house prices have remained stubbornly high and are heading back to their 2007 peak. 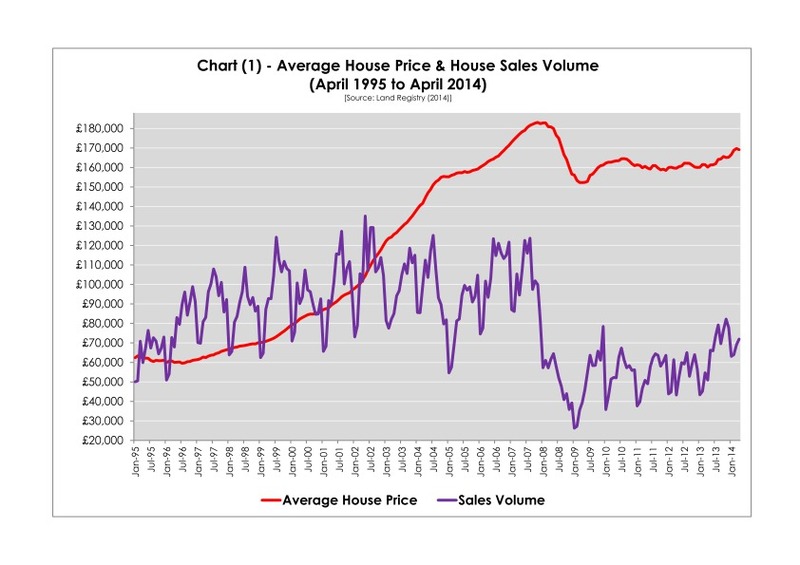 Chart (1) shows how low levels of house sales – indicative supply – has kept house prices much higher than they would have been if house building had been able to expand to meet demand. According to the Land Registry, the average house price is now more than £169,000, which is almost 6 per cent higher than a year ago. All English regions have seen average house prices above the rate of general inflation. Average house prices have increased by over 12 per cent in London, 7 per cent in the East of England and more than 6 per cent in the South-East. The affordability problem in the UK’s housing market has also been intensified by stagnant wages. As chart (2) illustrates, the ratio of the average house price to average income, at 6.7 to 1, is not much below the 2007 highpoint of 7.2 to 1. The traditional benchmark for house price affordability is an average house price of 3.5 times average income but has not been at this level since 1997. The affordability crisis can be seen in all parts of the country. There are only four local authorities where the ratio is at or below 3.5 to 1. In two thirds of districts, the affordability ratio is 6 to 1 or higher. In one in eight districts the average house price is more than ten times average income. House prices would need to half in most parts of the country to get back to an affordability ratio of 3.5 to 1. 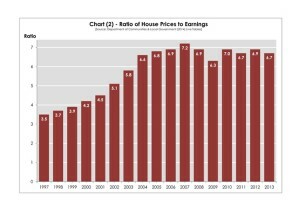 An economics lesson in house prices. Demand is high and so are prices in areas where there is a shortage. There is a shortage because there is nowhere to build houses without building on parks and green belt or going back to building up, tower blocks. Discuss.